No, not really, but one can wish, right? 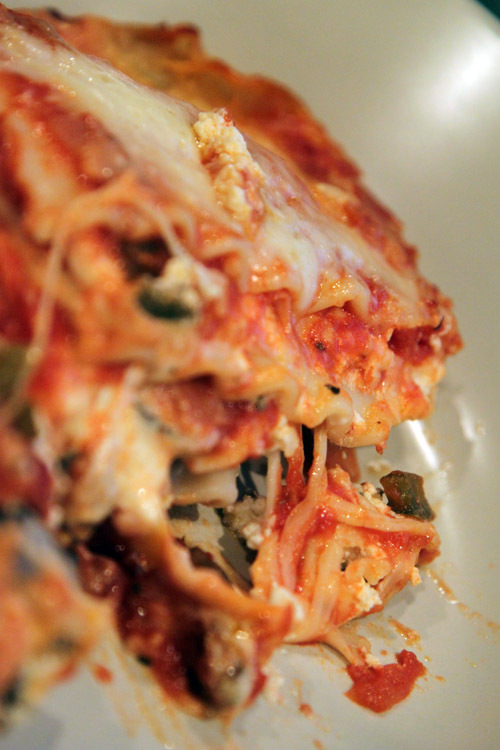 However, we did get some great inspiration from Bobby Flay’s Vegetable Lasagna Throwdown episode for our own lasagna. Watching the episode made the both of us drool (even if it was midnight) and we both instantly agreed to make lasagna the following day. In the Lasagna Throwdown, Bobby at first insisted on making his lasagna with mushrooms only (ding!) — eventually he was talked into adding creamed cauliflower. 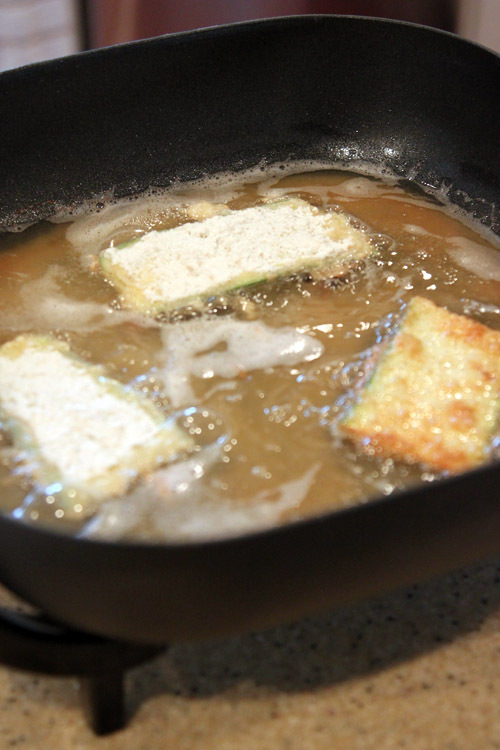 The challenger fried up some zucchini for her dish (ding!). Those dings! 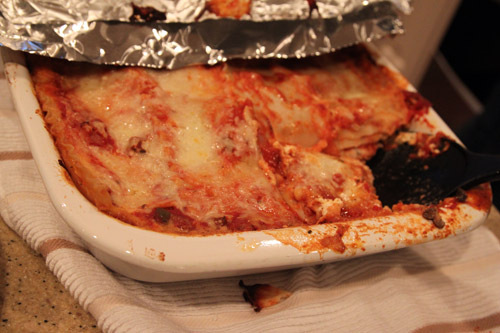 are what we took from the episode and added to our lasagna: mushrooms and fried zucchini. I first made a traditional tomato sauce which I inherited from my mother; which she inherited from her mother. Nothing fancy, but definitely a comfort food for me. 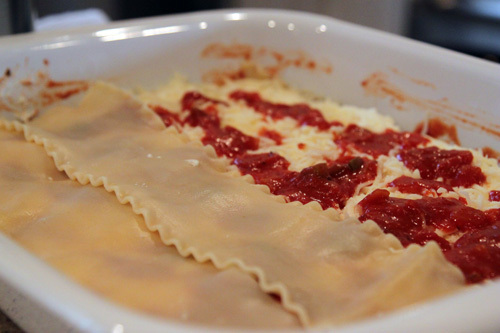 Any tomato sauce will do in lasagna — some like jar sauce, some like a bolognese sauce. Me? I stick to my mom’s sauce. To do the fried zucchini, I sliced it thin (maybe a quarter of an inch thick) longways and left the skin on, I dipped each slice in an egg bath and then dipped it in a combination of flour+salt+pepper+garlic-powder. I probably did 2 cups flour, 1 teaspoon salt, 1 teaspoon pepper, 1/2 teaspoon garlic powder. But honestly, any combination will work. After all, you are frying these bad boys. I fried each side of the zucchini until they were golden brown; roughly 4-5 minutes on each side. I then placed the zucchini on a cooling rack allowing the excess oil to drop down onto the paper towels. These things came out crispy and incredibly good. 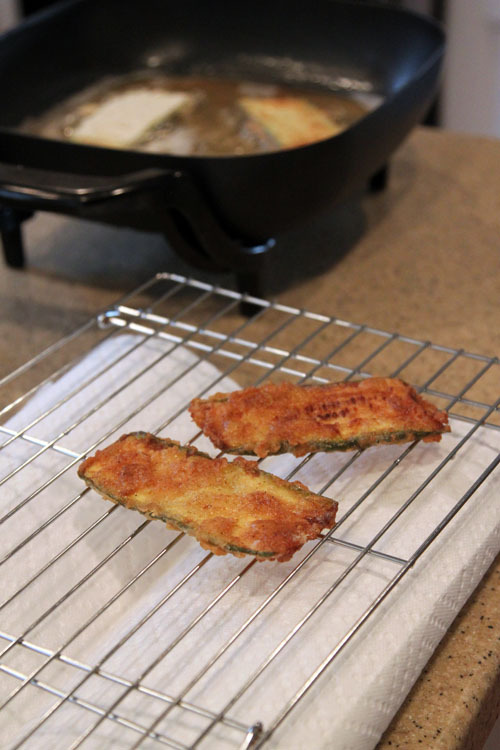 In fact, they were so good that we ended up making some fried zucchini sticks to hold us over. So good! The mushrooms were a combination of shiitake, portobello and cremini. I diced them up and sauteed them with a little bit of oil, butter and garlic. I also roasted some carrots in hopes of adding a bit of sweetness to the lasagna. I totally forgot to take pictures of the mushrooms and carrots — sorry about that. After the mushrooms, I prepared the ricotta mix which consisted of a large container ricotta, two eggs and some grated parmesan and romano cheese. From here, it was time to start doing the layers of the lasagna. And please forgive me, but while I was busy eating the zucchini sticks, I totally forgot to snap pictures of the complete process. 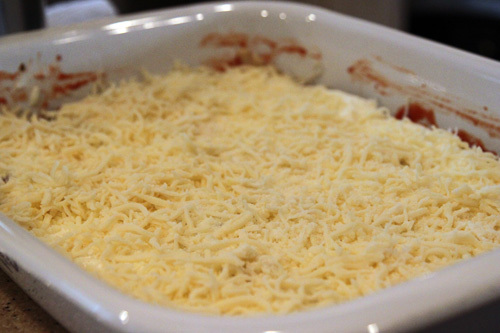 I started with a thin layer of the tomato sauce followed by a layer of the lasagna pasta. I placed the zucchini down next followed by the ricotta and then a layer of shredded mozzarella cheese. On top of the mozzarella, I added some tomato sauce. And then it was time to start my next layer by applying a layer of lasagna pasta. This was followed by the mushrooms as well as the carrots. 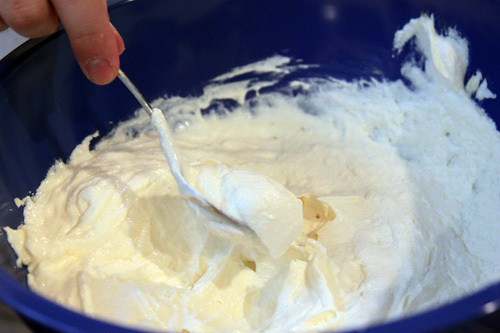 The ricotta mix, mozzarella and a spread of sauce finished this layer. I finished the lasagna with a layer of the ricotta, lasagna pasta, mozzarella and tomato sauce — in that order. The lasagna was then baked for about an hour; just enough for the top layer to be slightly bubbly and crispy/brown in some areas. By the way, we still have a half tray of lasagna sitting in our fridge if anyone wants to hit us up for some leftovers. Oh and mom, I have your lasagna tray. I stole borrowed it while you were away. It has a great home now. OMG that looks AMAZING!! Lets plan a visit again…we’ll bring the wine and dessert, you guys can make that awesome dish! I must try!!! love ya! this looks sooo good! I heart zucchini in my lasagna =) fried is just a bonus! Oh. My. Goodness. Sign me up for some of your leftovers. I saw that Throwdown episode too. Looks soo YUMMY! Mmmm… I’ll just take the fried zucchini to-go, please! that looks so amazingly good! I caught that episode of Throwdown! Yummers. Oh I love fried zucchini. Looks so good!